Featuring a landscaped garden with a terrace and a swimming pool, this B&B is surrounded by vineyards and offers views of Mont Ventoux. 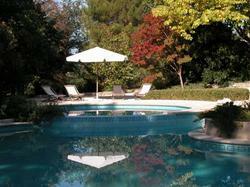 It is set in the heart of Provence, 3.8 km from Mazan. The spacious guest rooms at A Cappella are individually decorated and include an en suite bathroom. A fan is available upon request, and some rooms feature a private terrace and mountain views. Breakfast, including homemade jam, can be enjoyed daily in the breakfast room, which faces the vineyards of the Côtes du Ventoux. Free Wi-Fi internet access is provided in the B&B public areas. Free private parking is available on site and central Carpentras is just 10 km from A Cappella. The B&B is 38 km from Avignon-Centre Train Station and 34 km from Orange. The property will contact you directly after reservation concerning the method of payment. Please note that check-out is at 10:00 and that guests have access to the garden and swimming pool for the rest of the day. This bright and spacious room opens onto the garden. This bright and airy room features views of Mont Ventoux, the garden and the swimming pool. Bright and airy room with direct access to the garden. This bright and airy room opens up to a private terrace. This bright and airy room is set on the top floor and offers views of Mont Ventoux, the swimming pool and the garden. This room can accommodate a baby cot.